Due to an unfortunate tragedy, one of our Keystone families is in need of our support. To show this family our support, The Keystone Student Council is asking for students to wear pink and/or blue on Friday, April 12th, and to please send in a small donation. Any amount you can spare is appreciated. Registration will be held by appointment only from Wednesday, May 1, 2019, to Tuesday, May 7, 2019. Please call Marianne Mensinger at 267-599-2486 to schedule an appointment. All orders are due to your homeroom teacher by Thursday of each week. Click here for the arrival and dismissal procedures for the 2018 - 2019 school year. Registration: Wednesdays, and Thursdays from 8:30 AM - 10:30 AM. Please call Marianne Mensinger at 267-599-2486 for an appointment. Join our Google+ Community for news and updates! Go to Keystone Elementary PTO BTSD in Google + Communities and request membership. Please click here for the flyer. 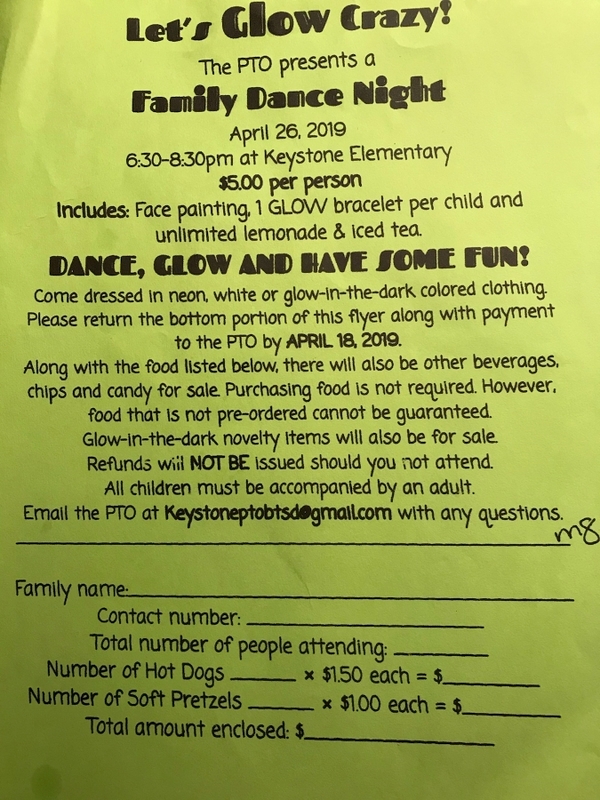 The PTO is doing a donation fundraiser. All money collected goes toward activities for the children in the school.